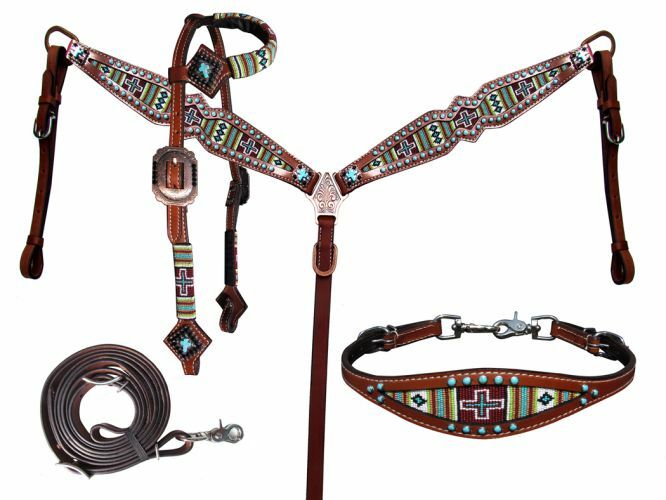 Showman ® 4 Piece beaded navajo cross print headstall and breast collar set. This set features medium leather with a turquoise, lime and brown beaded navajo cross design inlay. Accented with turquoise studs and copper conchos with black crystal rhinestones and turquoise cross stone. This set comes with single ear headstall, breast collar, wither strap and roping reins.